Perry Block - Nouveau Old, Formerly Cute: Oh, Pardon Me! Speaking jointly today, Senate Minority Leader Mitch McConnell and Speaker of the House of Representatives John Boehner blasted President Obama for his announced intention to utilize Executive Authority to accomplish one of his major stated goals before the end of 2014. "Here we are witnessing another shameless power grab by this Imperial President," said Speaker Boehner. 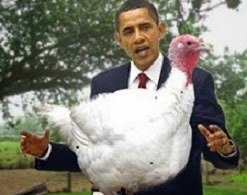 "Nowhere in the Constitution is authority given to the President of the United States to pardon a turkey! Not on Thanksgiving, not on Ronald Reagan's Birthday, not on any day." "If he can pardon a turkey without Congressional action," added Mr. McConnell, "can he pardon a chicken? What about shellfish? There's no end to it!" Both men were adamant that the pardoning of any form of wildlife must be approved by Congress after the selected animal has first been thoroughly vetted by the House Wildlife and Fisheries Committee. "Prior to any pardon being granted," said Mr. McConnell,"Congress must be satisfied that the turkey is not a socialist, a Communist, or especially tasty." "If the President persists in his current reckless behavior," Mr. Boehner and Mr. McConnell warned "he and the turkey are in for a very rude awakening!" *In fairness, Palin never said she could see Russia from her house in Alaska. What she said was "you can actually see Russia from an island in Alaska," which is accurate. Thanks, Roz. Happy Birthday, Whippersnapper! What a timely piece of writing, Perry. I shall forward the link to this post to all my Democrat friend, whom I know will enjoy it immensely. 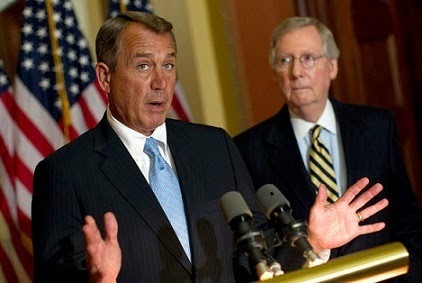 My Republican friends would no doubt side with Boehner and McConnell just on general principle. And my NRA friends would take it a step further and hold a turkey shoot. Here's hoping the President does not pardon the NRA types. I mean, did I say that? Happy Thanksgiving, Russell! I like an Imperial president. I thought our last president was especially Imperial. This year I'm going to vote for Anthony - and the Imperials! That's Little Anthony and the Imperials to you, Randy!